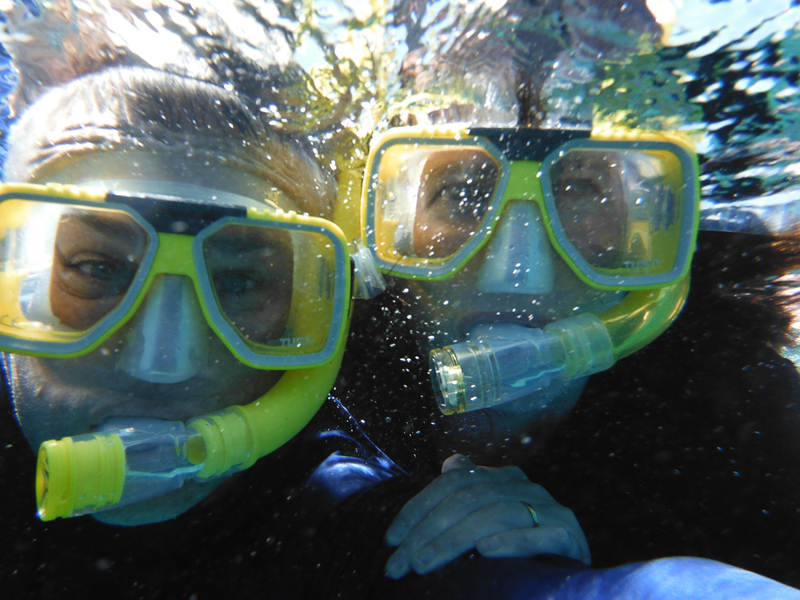 We had booked a trip to the outer reef with Quiksilver Reef Cruises. I was warned to take seasick tablets as the ride out could be a little rough. I heeded that advice, many didn’t & paid the price. I wondered when we left the dock, why the cruise staff were standing around with airline sick bags, I soon found out!! Luckily not for us!! It was pretty choppy & I was glad to get out to the reef. It takes approximately 1.5hrs to get out to the outer reef. Buffet lunch was included in the price of the cruise, we had lunch as soon as we arrived so that we were then able to spend the rest of the day in the water snorkelling. I chose the option of hiring a stinger suit for the day as it was the beginning of stinger season. The stinger suits are very unflattering! I’m glad I did as the water was a bit choppy as the weather was a bit overcast. 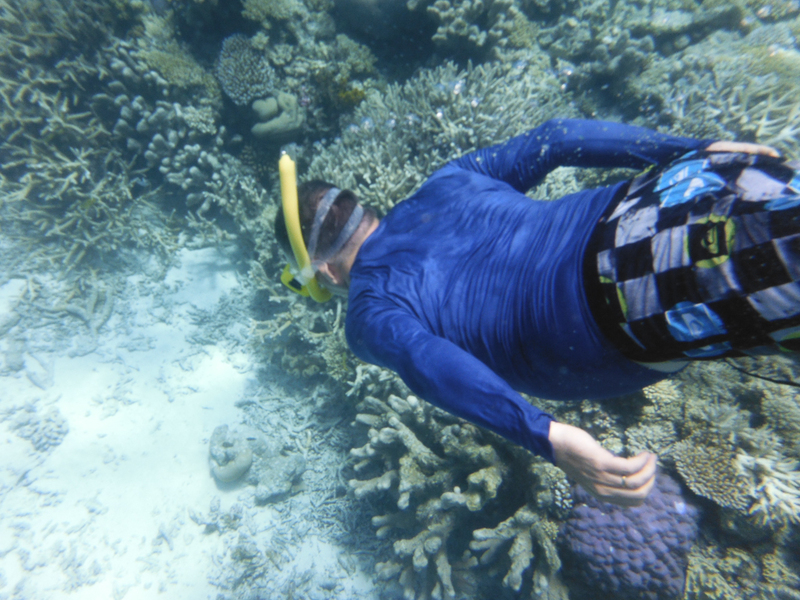 This was the first time I have snorkelled, it took me a while to find my mojo! At the beginning I was panic breathing & had to really concentrate on slowing my breathing down. Once I got out from around the platform where everyone was trying to get in on top of each other, I calmed down & started taking in what I was seeing below. I was amazed with what I was seeing. I kept grabbing Craig’s arm & pointing at ever thing. Craig is quite a good snorkeler & was diving down closer for a better view, I was not able to do that. I was happy floating along the top & watching all the fish beneath me! There were loads of fish, all sorts of colours but unfortunately on this occasion I did not see a nemo (clown fish). 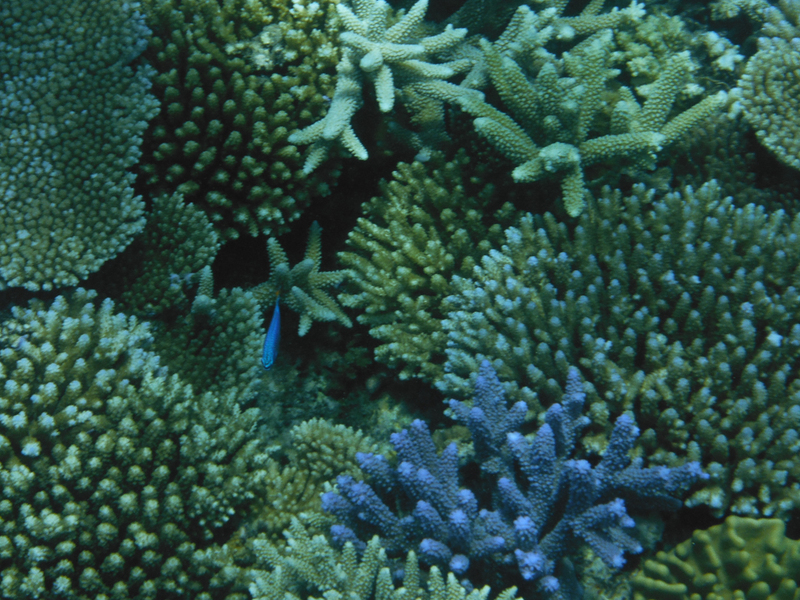 The coral was a bit dull, although I was told this was because the weather was overcast. There was plenty of blues & yellows but mostly earthy yellow & brown colours. My underwater camera had its first run there & the photos come out really well. We stayed in the water almost the entire time we were at the pontoon. We came out once to have an icy pole & send the kids a postcard from the on board post box.